This beautiful silk fabric necklace has a signature motif at the center with a "floral" design surrounded by "petals" along with delicate dimensions around the neck. There is no clasp so it simply slips over your head and around your neck for an exceptionally soft, light and warm accessory. This versatile and fun work of art is a real conversation piece that accessorizes any outfit, from the boardroom to a night on the town. Pair it with jeans or a little black dress to take a simple, comfortable outfit to the next level. 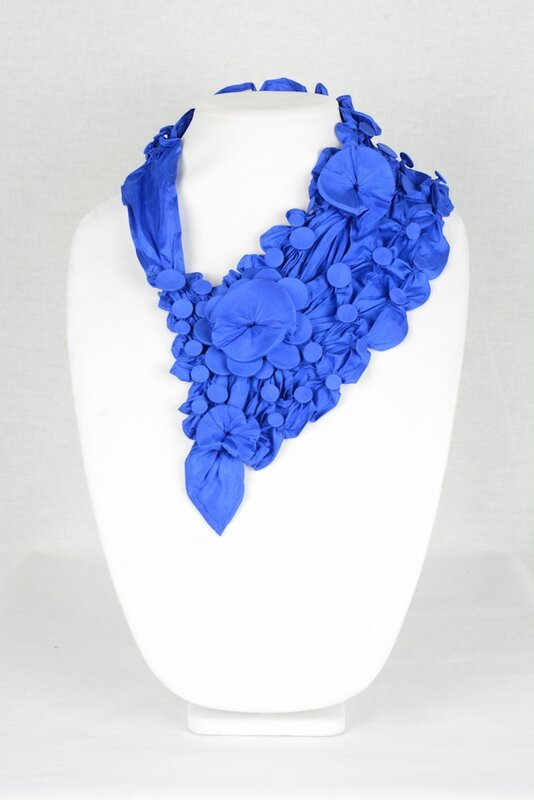 Once you've added a silk shibori fabric necklace to your wardrobe, you'll wonder how you ever survived without it!